For more than two years the recordings remained untouched, until recently, now in Tokyo, they were mastered, and recorded to new tapes. The affects of the cold, the sudden sunsets through the snow, and the night winds still stay in my mind, like a soundtrack to those two months, not without their own songs of loneliness but with also beauty, sounds seeming like a siren, embracing every unchangeable and otherwise forgetful moment, even in the bitter winter. Although not as indiscriminate as is denoted by the term, I am often a completist when it comes to collecting the works of selected authors and musicians. Yet, I would be hard-pressed, given his massive output of creative work, to even begin to collect all the music of Will Long in the guise of Celer. 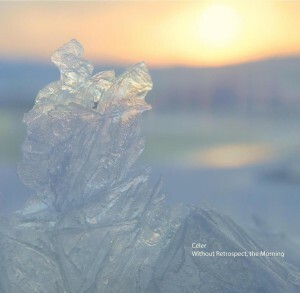 By now, I probably have a dozen or so of Celer’s recordings, but if I had to recommend one and only one recent work, it might just be this almost mystical and entrancing album. I’m also drawn to this release since it fulfills one of the most significant inspirations for why I listen to music—it takes me somewhere, and the images and sensations are vivid. This is the third work in a trilogy based on water (to some, water symbolizes comfort and freedom). The two previous albums are Cursory Asperses (2008) and Escaping Lakes (2009)—the former alluding to the slow movements of small streams and the latter to the calmer depths. The music on this album being inspired in part by Will’s trip to southern Alberta in 2009 (documenting the wilderness in photographs for a local Park Service). Without Retrospect, the Morning is different from the first two in the series in that it has distinct tracks (versus a continuous thread of sound) and it captures water (or the sense of it) in a different state—a chilled desolation, at times at the edge of an existence where the potential energy is stored and released ever so sparingly in a landscape yearning for Sun and warmth. It’s therefore appropriate that this album landed at the Glacial Movements record label, a self-proclaimed “glacial and isolationist ambient” label. I also appreciate that the recording has been mastered with a softness that retains the intricate clarity of the many layers of sound buried in the crystalline strata (to heck with the loudness wars!). There are also hidden sonic depths, and some passages might be felt before they are heard (as in Dry and Disconsolate). A lateral effect of this CD is that it triggers (for me) some pleasant, albeit quirky, sonic memories from long ago. I’m a fan of the original 1960s Star Trek. There was some great incidental music and ambient sounds used in that series that, to my ears, are recalled in a track like Distance and Mortality (see if you hear the resonance of the wind from the pilot episode, The Menagerie or the sound of the transporter beam). So find a quiet room, bundle-up, get comfortable, and explore stunning breadth of this vast hyperborean landscape. Just remember to turn the volume back down on your amplifier before you change the sources on your preamp or pop-in another CD. Celer has always been an artist who can effortlessly dream up evocative drones and a deep-thought style of ambient introspection. Always refreshing, always vividly alive and constantly absorbing into the very atmosphere, Will Long’s music touches upon phantom shades and faint degrees, almost to the point of aural invisibility. Without Retrospect, the Morning, is no different than that of Long’s multiple releases, in that it is ambient music of the highest caliber, and yet it is a departure, for it contains his coldest music to date. Created in 2009 while Long was working as a photographer in South Alberta, Canada, Without Retrospect, the Morning is cold to the touch, and just slightly under a sub zero temperature, but the diluted light saves it from becoming an icy tundra of drone. The early morning – late sunset sound was primarily recorded using two Sony Tapecorder open reels, an endless delay system and contact microphones, resulting in an unrivaled organic purity and depth. The weak light, and the quiet still of Winter, can be seen reflecting off sharp, crystal drones, as light as a white-whispered cloud sent up into the cold air, and Long’s stark crystals of ice are lightly glazed with a smooth flowing current of ambient air. “A Small Rush Into Exile” glows an almost eerie colour against the rising sun, silently transforming as strands of notes slowly rise up and over the crystal. These drones are like shards of ice that have broken off and become displaced, removed from an original, wider structure. Will Long has been active enough for long enough to have perfected his source and his sound, and the inner musical momentum within the seven tracks is just right. The music almost seems to pour from concealed cracks in the ice, creeping out of the recording process in thin, cool channels that are able to warm their cold blood in the sun. Sub bass frequencies deepen the tone, as if pulled under a flurry of powdered, soft snow; this is the beautiful contrast, the deeper shell of clinking ice and the ethereal air above it. For the most part, the arrival of the bass is non-intrusive, instead of influencing the warmer air and dragging it downwards. The pure transparency of the drones offer plenty of temperate warmth and help to subdue any rough daggers of ice that may remain, glowing defiantly in dynamic swells in beautiful contours. Raise the atmosphere, if not the temperature, and this is due to the dimmed volume throughout the record, which only rises an inch above the white. A gorgeous cover complements the clarity of the music – seeing the cover art is enough to produce shivers down the spine. Long’s restrained technique helps to focus in on the miniscule, where the true alterations occur; it is inside the tone, and its constant change, that really separates ambient musicians, and turns the music into a true art-form. These seven pieces don’t stray far from their source – there isn’t enough energy inside – yet they are always allowed the capacity to evolve at their own pace if they should wish to do so. The music is without a companion; the only survivor amid a solitary stretch of snow and ice, awakening to the fragile light of dawn. Finally, “With Some Effort, the Sunset” emerges, shining above all of the previous six tracks, as vapour rises and the light descends. A lower frequency is more prominent, perhaps as the force of the sunset, quietly cooling and returning to what has been, fading for another day. Celer’s music is in plentiful suppy, but ambience as smooth and as thoughtful as this is very difficult to find. Once it is found, it’s a sound we should treasure, and it ensures that Without Retrospect, the Morning is a stand-out release in an amazing discography. A shushed drift, the drone is only a thin slice of ice, lit by the morning, cool in her departure and born again on her rising. Celer to ambientowy projekt powstały w 2005 roku z inicjatywy małżeństwa Williama Thomasa Longa oraz Danielle Marie Baquet. Na swoim wydawniczym koncie Celer posiada całą masę płyt, mogę tylko przypuszczać, że pozostałe są również utrzymane w klimacie zimnego nordyckiego ambientu. Ostateczny szlif zimnej niczym lód “Without Retrospect, The Morning”, William Long nadał w Japonii, gdzie przeprowadził się po śmierci żony. Glacial Movements, wydawca m.in takich tuzów jak Rapoon, Francisco Lopez czy Bvdub zdążył już nas przyzwyczaić do mrocznych i gęstych dark ambientów lejących się powolnym tempem z głośników. Tym razem, mamy do czynienia z totalnie lodowatym, surowym i dość minimalistycznym spojrzeniem na ambient. Album “Without Retrospect, The Morning” wyraźnie podzielono na dwie części. Pierwsza to wycieczka po kole podbiegunowym w otoczeniu wschodzącego słońca. Zimne klawiszowe pasaże ilustrują wietrzny i mało przyjemny klimat. Druga część to powoli następujący mrok. Zrodzony z delikatnych szumów, przepełniony izolacjonistcznym i sennym klimatem. Celer daje nam wyraźnie znać, że ta wypełniona chłodem oniryczna wyprawa dobiega końca. Zatopiona w mglistym, odrealnionym klimacie muzyka Celera jest doskonałą ilustracją arktycznych krajobrazów. I choć może nie każdy lubi jak chłód zagląda do jego domu, warto dać się ponieść tej mistycznej podróży. Quello tra Alessandro Tedeschi e Will Thomas Long era un incontro in qualche modo inevitabile, per la genuina passione con la quale entrambi interpretano la loro attività creativa e per la loro inclinazione a trarre ispirazioni da elementi naturali o atmosferici. Non poteva quindi trovare miglior collocazione dell’etichetta romana Glacial Movements, dedita all’esplorazione di un isolazionismo ambientale ghiacciato, il terzo capitolo della trilogia a tema acquatico di Celer, che già si era manifestata in “Cursory Asperses” e “In Escaping Lakes”. Dunque il ghiaccio quale trasformazione dell’acqua, così come il suono quale variazione infinita dell’interazione tra elementi, quando non prodotto della spontanea interazione tra field recordings e oscillazioni minimali che lambiscono il silenzio o lo smuovono flebilmente. Opera breve, almeno per i suoi monumentali standard (“appena” cinquantadue minuti), ed estremamente delicata, “Without Retrospect, The Morning” è incentrata sulle frequenze più basse del ghiaccio, della neve e del vento, catturate in occasione di un soggiorno di Long nello stato canadese dell’Alberta, nel corso del quale ha altresì lavorato precedenti registrazioni di piano e synth, riducendole a un’essenziale stato gassoso attraverso filtraggi e prolungatissimi delay. Ne risultano segnali sonori inafferrabili e quasi del tutto uniformi, tanto da richiedere un ascolto a volume elevato per poter cogliere le impercettibili variazioni di suoni che per buona parte del lavoro stentano quasi ad essere percepiti come tali. Sarebbe decisamente ridondante, in proposito, interrogarsi sul senso ultimo di una simile operazione ed è ben possibile che, nel farlo, qualcuno possa giungere a conclusioni recisamente negative; tuttavia, una volta poste in relazione le risultanze auditive con le finalità concettuali ad esse sottese, si può ben dire che “Without Retrospect, The Morning” adempia appieno la missione di restituire in forma sonora le sensazioni atmosferiche che ne costituiscono l’essenza più profonda. Ciò avviene tanto nel soffio leggero di “Holdings Of Electronic Lifts” e nella nota risuonante di “A Landscape Once Uniformly White” quanto nelle dense saturazioni di “Dry And Disconsolate” e “Distance And Mortality”, le cui torsioni droniche si inarcano in sibili in moderato crescendo. Quando poi si giunge ai conclusivi tredici minuti di “With Some Effort, The Sunset”, l’uniforme coltre nevosa si colora di riflessi aurorali, aprendosi con incedere narcolettico alle suggestioni più fuggevoli dell’ispirazione di Long. Che se ne colgano i profili formali di opera certamente non incentrata su variazioni significative o ci si lasci avviluppare dalle sue frequenze ipnotiche, “Holdings Of Electronic Lifts” costituisce un perfetta colonna sonora della neve e del vento, evanescente e sottile come gli elementi che l’artista californiano – che, ironia della sorte, sostiene di detestare il freddo – ha provato a trasformare in suono. Celer è il progetto di Will Long. Come avrete forse già avuto modo di leggere, lo condivideva assieme alla moglie Dani Baquet (Chubby Wolf), purtroppo scomparsa nel 2009 all’età di 27 anni. Without Retrospect, The Morning, origina sempre dal 2009, anno nel quale Will ha raccolto field recordings in Alberta e registrato su nastro suoni di synth e piano, con l’intenzione di chiudere una trilogia intorno all’elemento acqua, composta dagli album Cursory Asperses e In Escaping Lakes. Su questi suoni Will ha applicato soprattutto l’effetto delay, come sarà chiarissimo sin dal primo ascolto di questo album, sul quale ha trovato il modo di lavorare due anni dopo mentre era nella sua casa a Tokyo, città nella quale oggi vive. Si tratta di un’uscita Glacial Movements al cento per cento. Alcuni frangenti potranno ricordare Netherworld come altri dischi presenti sul catalogo, perché certo modo di usare il synth ed effettarlo è evidentemente connaturato a come un artista immagina coi suoni un paesaggio polare. Solo che qui è tutto portato all’estremo di rarefazione e fragilità, un’operazione che di certo non spiazza e non è innovativa, ma che è il marchio di fabbrica di Celer. Va detto che – paradossalmente – queste linee di synth che si consumano progressivamente, in epoca di disintegration loops e altra elettronica che fa dell’onirico e dell’imperfetto la sua cifra stilistica, rappresentano un po’ lo zeitgeist pur venendo in realtà da molto lontano (Thursday Afternoon di Eno, per dire?). Celer è un progetto con una discografia molto corposa: questo “passaggio di evidenziatore” da parte di Glacial Movements potrebbe far fare una bella scoperta agli irriducibili italiani di queste sonorità.